ABU DHABI, United Arab Emirates -- Middle East countries are getting serious about building robust, highly technological defense-manufacturing businesses, primarily driven by the desire to break free of economic dependence on oil. Gone are the days of billion-dollar foreign military sales deals where jets, tanks, missiles and other articles of war are purchased in abundance without consideration of how to support equipment independently of foreign manufacturers. And companies that rely heavily on foreign military sales to the Middle East are finding ways to adapt to the new requirements from the Gulf region. While FMS offset arrangements already exist, which requires some assembly in the country buying the equipment, this superficial manufacturing is no longer enough. "The decline in global oil prices has brought forward an urgent emphasis on policies encouraging economic growth and economic diversification," according to US-based consulting group Avascent's white paper on industrial strategies in the Middle East. Saudi Arabia last year announced that half of its defense requirements would come from domestic suppliers as part of its Saudi Vision 2030. Other countries have formed defense development organizations such as the Emirates Defence Industries Company (EDIC) and technology parks like the Qatar Science and Technology Park. But Gulf countries are still in the nascent stages of building indigenous manufacturing capabilities. According to Avascent's calculations, only the United Arab Emirates is considered to have a high degree of in-house defense and aerospace industry. Saudi Arabia, Egypt and Jordan are considered to have moderate levels and Iraq, Oman, Qatar and Bahrain have a low degree of internal industry. The UAE also has a high-degree of international defense original equipment manufacturers (OEMs) in-country, while Saudi Arabia has a moderate presence. The rest of the region has a low presence from foreign companies, Avascent found. It is estimated that Saudi Arabia will invest $129 billion from fiscal year 2016 through 2021 and the UAE will invest $41 billion in defense. Iraq comes in third, with plans to invest $36 billion and Qatar follows close behind with plans to invest $35 billion. All the rest fall under $20 billion. Commercial specialist for the U.S. Embassy in the UAE, George Messiha, said at Abu Dhabi's International Defence Exhibition last week that the UAE, like the rest of the Gulf countries, "want to develop a knowledge-based economy," which means developing high-tech manufacturing capabilities in-country that will help it break away from oil dependence and develop skilled "Emirati nationals." He added that while many people see developing such manufacturing as a challenge, there are also "great opportunities." Fred Aziz, the commercial specialist at the U.S. Embassy in Saudi Arabia, echoed Messiha at IDEX, stating that foreign companies would have "much greater chance of success" if they were to align proposals with the country's Vision 2030. The commercial specialist at the U.S. Embassy in Egypt made it very clear the country is no longer interested in just buying platforms from the U.S.
"Egypt currently is focusing on in-house capabilities," Mai Abdelhalim said at IDEX. "Egypt has 26 factories and they are looking for in-house capabilities of these factories, so they are looking for co-production and maintaining existing equipment. . . . Of course, financing capabilities are welcome." When asked what Egypt's future in terms of purchasing more infantry and combat vehicles might be, Abdelhalim answered: "The military is working on enhancing the capabilities of the military factories." She said four of the 26 facilities are focused on the manufacturing of armored vehicles and tanks. 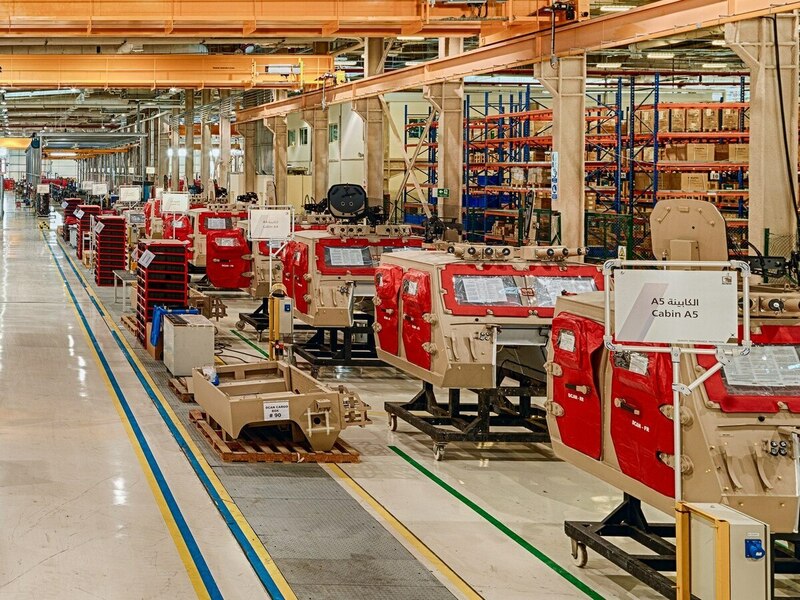 The UAE's NIMR Automotive made several announcements over the course of IDEX that it would build a wide variety of vehicles in its new Ajban, Abu Dhabi facility, which is now the largest military vehicle manufacturing plant in the Middle East and North Africa. On the first day of IDEX, it was announced NIMR would manufacture several hundred 8x8 armored vehicles for the country's armed forces. On the last day, the company said it would build 1,750 more combat vehicles for the UAE. NIMR also signed a strategic cooperation agreement with Czech manufacturer VOP CZ for sales and production of the entire range of its armored vehicle products to the Czech Republic, Poland, Slovakia and Hungary. In Saudi Arabia, U.S. Army Maj. Gen. Frank Muth -- who is in charge of the Saudi Arabian National Guard modernization program -- told Defense News in an interview at IDEX that his outfit was helping to conceive a plan to modernize the SANG’s 20-year-old Light Armored Vehicles, as part of a huge push to establish meaningful manufacturing business internally. "We are looking at building a facility within Saudi Arabia, which allows for us to do all that work here instead of potentially sending it somewhere else to get done," Muth said. The facility would have a level of general support maintenance, but also would be able to execute a 10-year plan for life-cycle maintenance and modernization. Industry also came to IDEX armed with plans not just to sell defense equipment to the Gulf but to build in the region. Paramount Group, a large South African defense company, has long understood and pushed for production facilities in the countries in which it does business. And the company relies on such arrangements for its own success. "Most of the equipment we produce has a 25 to 30 year life, so when we get involved with the government, it’s a marriage," Ivor Ichikowitz, Paramount’s founder, has said. "And the best way to make that real is by establishing production in the customer’s country." For example, Paramount established in Kazakhstan the largest armored vehicle factory in that region, potentially in the world. U.S. automotive company AM General brought a "Multi-Purpose Truck" vehicle to IDEX that it never intends to build en masse but was showcased to make a point about the evolving market. The company wants to sell trucks to countries around the world based on individual requirements. AM General doesn’t just want to build vehicles, sell them and walk away, but to establish manufacturing, supply chains and life-cycle logistics in country. While some companies are on board and adapting, it's still challenging for the Gulf region to strengthen indigenous defense manufacturing while still getting the best foreign equipment money can buy. Avascent noted in its white paper that while governments have begun "localization and technology transfer, they largely defer to prime defense integrators and OEMs to determine which aspect of the work to onshore and which technology to transfer." That leads to OEMs and prime contractors making decisions that "maximize profitability" and minimize disruption to their global supply chains, which often leads to a lack of meaningful technology transfer, Avascent states. And companies or "microcosms" of industries are often brought to life simply to support one contract or platform, according to Avascent, which doesn’t help build the industry over the long haul. Avascent says countries should refrain from trying to develop a full portfolio of capabilities but rather focus or prioritize "strategic areas of emphasis" and get a more firm handle on the composition of their industrial bases and where it makes the most sense to grow.